Bridwell stood 5-feet-9 and weighed 170 pounds. He batted left-handed and threw right-handed. 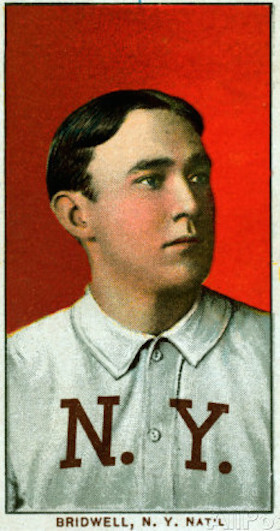 The Reds used him as a utilityman in 1905, and he hit .252 in 82 games. “For a beginner, he did well,” said Sporting Life.13 The Reds traded him, and in 1906, he was the starting shortstop on the last-place Boston Beaneaters. Bridwell showed great range in the field but was weak at the plate, with a .227 batting average and only 10 extra-base hits in 459 at-bats. On June 8 McGraw surely regretted trading Bridwell, as the Cubs defeated the Giants, 2-1, in 10 innings. Bridwell managed the 1919 Houston Buffaloes of the Texas League; Branch Rickey had recommended him for the job.45 When the team needed an outfielder, “Bridwell leaped into the lineup in the left field and has been grabbing long flies, chucking men out at the plate and whacking the ball with a right good will.”46 Over the next five seasons, he managed and/or played for teams in Rocky Mount, North Carolina; Spartanburg and Charleston, South Carolina; Oneonta, New York; and Tamaqua, Pennsylvania.47 He retired from baseball in 1924, at age 40. Looking back on his baseball career, Bridwell said: “I don’t really think I’d change a thing. Not a thing. It was fun all the way through. A privilege, that’s what it was, a privilege, to have been there.”50 On January 23, 1969, the slick-fielding shortstop died at the age of 85, in Portsmouth. The author gratefully acknowledges the pioneering work of Larry Ritter, who interviewed Al Bridwell and other former ballplayers in the 1960s. Ritter’s masterpiece, The Glory of Their Times, continues to inspire the author. 1 El Paso (Texas) Herald, August 20, 1910. 2 Washington Times, August 8, 1910. 4 Lawrence S. Ritter, The Glory of Their Times: The Story of the Early Days of Baseball Told by the Men Who Played It (New York: Vintage Books, 1985), 125. 5 1880 and 1900 US Censuses. 8 Chicago Daily Herald, April 14, 1911. 10 Sporting Life, June 20, 1903. 11 Sporting Life, November 5, 1904. 12 Sporting Life, April 22, 1905. 13 Sporting Life, November 11, 1905. 14 Sporting Life, June 1, 1907. 15 Altoona (Pennsylvania) Tribune, January 30, 1908. 16 Sporting Life, January 18, 1908. 17 Altoona Tribune, March 19, 1908. 18 Sporting Life, September 12, 1908. 19 New York Times, September 9, 1908. 23 Sporting Life, January 2, 1909. 25 Altoona Tribune, September 1, 1909. 26 Kingston (New York) Daily Freeman, August 9, 1915. 27 Sporting Life, June 25, 1910. 29 Pittsburgh Press, July 15, 1910. 30 Chicago Day Book, August 20, 1913. 31 Salt Lake Tribune, August 20, 1911. 32 St. Louis Post-Dispatch, October 28, 1911. 33 Sporting Life, March 16, 1912; Pittsburgh Press, May 16, 1912; Pittsburgh Post-Gazette, August 2, 1912. 34 Boston Globe, August 9, 1912. 35 East Liverpool (Ohio) Evening Review, November 13, 1912. 37 Pittsburgh Gazette Times, April 9, 1913. 38 Chicago Inter Ocean, April 11, 1913. 39 Chicago Inter Ocean, April 29, 1913. 40 Chicago Day Book, June 9, 1913. 41 Chicago Day Book, July 5, 1913. 42 Portsmouth (Ohio) Daily Times, January 23, 1914; 1920 and 1930 US Censuses. 44 Indianapolis News, May 2, 1918; World War I draft registration. 45 Houston Post, March 16, 1919. 46 Houston Post, August 16, 1919. 47 Waco (Texas) News-Tribune, July 9, 1921; Oneonta (New York) Star, February 26, 1923; Shamokin (Pennsylvania) News-Dispatch, February 16, 1924. 48 Charleston (West Virginia) Daily Mail, July 20, 1931; World War II draft registration.